Precision Putting Greens synthetic, artificial or fake putting green installation pricing is dependant upon a number of factors, the primary factor in estimating project cost is the size. 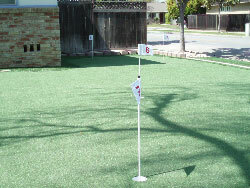 The larger the synthetic, artificial or fake putting green project is the lower the installed cost/sq-ft price should be. This is not a hard and fast rule as the site may have to be assessed. Terrain, access to the site, distance of base material to the site, access of equipment and personnel safety are primary considerations. under 100 sq-ft will cost $3,000 or higher. between 100 and 200 sq-ft will cost at $3000 to $7,000. between 200 and 1000 sq-ft will cost from 7,000 to $22,000. greater than 2000 sq-ft can cost from $32,000 and higher with increasing square footage. 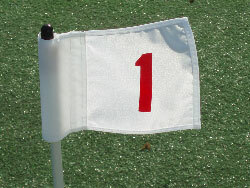 The $/sq-ft cost for commercial and large residential putting green projects > 4000 can be significantly lower. Precision Putting Greens use synthetic, artificial or fake putting green materials from a number of manufacturers but we tend to use the most reliable and highest quality vendors. But, these prices are more like guidelines only. Precision Putting Greens promote these price ranges to enable you, the consumer to decide whether Precision Putting Greens services are within your project budget. I think it saves everyone a lot of time. Precision Putting Greens gives you many ways to choose the look and feel of your putting green. You can mix and match three different Polyethylene or Nylon putting green materials from the Synthetic Putting Green Material Choices with Synthetic Putting Green Fringe Material Choices for the fringe of your putting green. All of these fringe materials greater than 60 oz face weight ad are included in the quoted price. Once Precision Putting Greens has constructed your putting green and identified expectations for your greens, we will develop a maintenance program based on your needs and requirements. At Precision Putting Greens we base our maintenance recommendations on the specific need of the individual clients. The frequency of maintenance is based on how much the green is used, the number of people playing on it regularly, outdoor weather conditions, age of the green, etc. Precision Putting Greens synthetic, artificial or fake putting greens benefit from two distinct maintenance programs that are tailored to the golfer expectations and abilities, specific needs and conditions of your golfing experience. Projects between 100 and 200 sq-ft will be priced at a minimum of 6 to 8 $sq-ft. 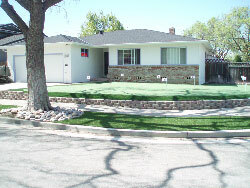 The regular maintenance program is recommended at least once every 12 months in the spring or summer. - $700 (Min. Charge) Maintenance consists of infill application, top dressing addition and adjusting the speed of the green to the clients specifications or a Stimp meter of 12. Precision Putting Greens will maintain your synthetic, artificial or fake putting green up to 4 times per year for up to 1/3 off the regular maintenance prices.